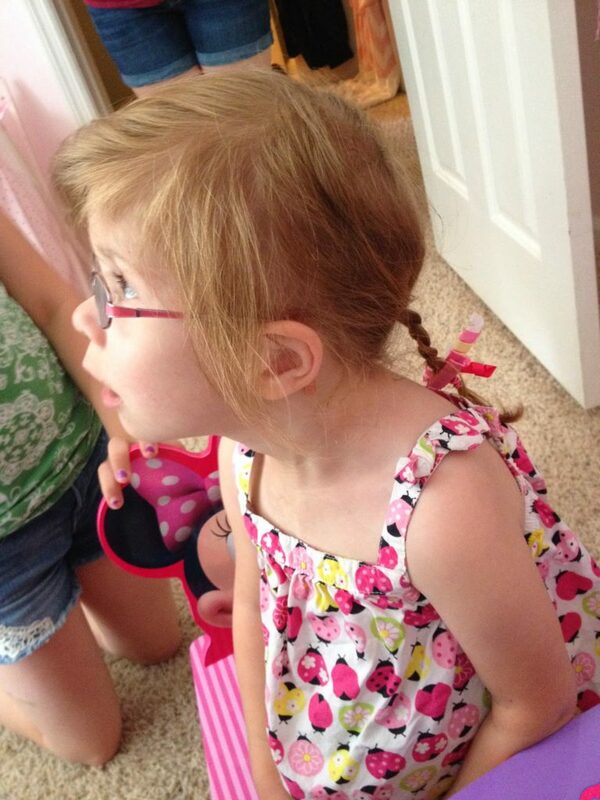 Big sis braided her hair…. We are officially in mourning. We are (attempting to) wave goodbye to naptime. Starting in August, Annabelle will be going to school in the afternoons vs the mornings, which means she will be at school during her normal nap time. Mommy may have wept a little when she got the letter. I waited until after the kids got back from vacation (aka I had help to keep her entertained all afternoon!) and then starting on Tuesday, attempted to kabosh the nap. Day 3 was the best day yet! A little fussy, but no nap. I put her to bed at 8:30, tucked her in, and daddy played his guitar and sang to her, as is our habit. And…. WAIT FOR IT… the princess WENT TO SLEEP. No getting up 5 times, insisting I sleep in her room with her. I mean, it might be a flook, but hey, I’ll take it. She only woke up once during the night, and I took her back to her bed and she fell right back asleep. The only UGH part of this is that she woke up at 6am this morning. 7 would be a little more desirable… but hey, I almost got a full nights sleep. I won’t complain! Part of me is also a little sad because… well… she’s my baby. And she’s almost done with naps!!! My baby girl is growing UP!!! Time flys when you’re having fun and doing fun things like growing!! I’m excited. I always thought the milestones with my last child would be bittersweet, and maybe to a point they are. But with Annabelle… each and every one is a miracle. There were so many days she slept induced by medications because her body was too sick. There were so many days we thought she’d never make her first birthday, or her second. I live each day with the realization that her life is a gift, a precious, amazing, miraculous gift. Sometimes I don’t ACT like it. I’m like every other momma out there. I get irritated and frustrated at her. There are moments I honestly just want to scream at the top of my lungs. I take for granted the gift. But I never stop being thankful for it. I never stop loving it. Discussion: Oh, it’s Friday. We can talk about anything! Do your kids still take naps? How do you handle kiddos growing up? Is it a celebration, or a time of weeping? Hope it is going better!